The Fiskars Rotary Cutting set has everything you need for cutting fabric pieces and is a great choice for beginners. 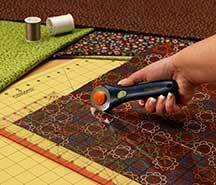 With a 45mm rotary cutter, cutting mat and quilting ruler Fiskars have created this convenient set for both new and experienced quilters. Classic Rotary Cutter – cuts multiple layers with ease and features a rolling 45 mm blade. Get straight accurate cuts as without jagged edges. Cutting Mat – 18-Inch x 24-Inch extra-large mat with an easy-to-read measuring grid. it has a double sided surface and is self-healing, great for longevity. Acrylic Ruler – A clear 6-Inch x 24-Inch ruler lets you see where you’re cutting. 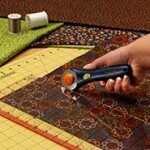 Shape cutting is made simple with the grid and highlighted seam allowances make strip cutting a breeze. Easy to store – Can be stored flat and out of the way under a chair or bed. Easy to clean – Just warm water and mild soap is that’s needed to clean the mat. The full size mat makes it big enough to cut up strips and square up your blocks. The double sided mat is marked on both sides so just flip it over if one side gets messy. The mat is also easy to read being pastel yellow on one side and green on the other. The ruler is marked in inches going in both directions meaning you don’t need to turn the ruler to square your blocks. The large rotary cutter blade means it will cut more layers of fabric. The cutter is suitable for both left and right handed people. The lines on the ruler are very fine so tricky to read. When cutting 3/4 of the blade is exposed, you need to make sure the safety cover is on every time you lay it down. The button to close the safety cover is on the side, not as easy to use a front covers. 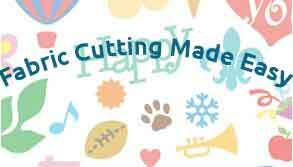 Buy the Fiskars Rotary Cutting Set here and start cutting! Really informative! I’ve been thinking about starting to quilt, but a little overwhelmed by all the choices. Your site will be a great help! Thanks!